On this page are some items which have been selected as unique gifts for any flintknapper that you might know. 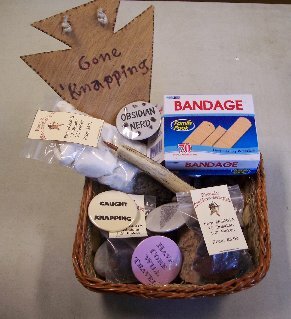 Also available are Gift Basket selections. We are always looking for ideas of items to add to our selection here. Be sure to check out the wide selection of tools, material supplies, and kits on the other linked pages. Specific ideas include: the Adjustable Flintknapping Handle, a Knapping Bag, or any Flintknapping Materials. Display your love (as well as your humor) of Flintknapping with your choice of these sayings on either buttons, stickers or magnets. We are always looking for more sayings. Random Lots are available at discounted prices for fundraising. Find more unique options on the Archaeologist and Other Gift Pages. D. Have Core Will Travel E. My Best Friend is a Flake F. Got Flint? This basket contains: A Bandaid Box, Five Random Buttons (#FG002), Antler Handled Copper Ishi Stick (#FKS022), Two Bags of One to Two Inch Obsidian Flakes (#FS001A), and One Bag of Two to Three Inch Obsidian Flakes (#FS001B). This basket contains: A Bandaid Box, Five Random Buttons (#FG002), Adjustable Pressure Flaking Handle (#FKS020), Reinforced Palm Guard (#FKS009), Three Bags of One to Two Inch Obsidian Flakes (#FS001A), Two Bags of Two to Three Inch Obsidian Flakes (#FS001B), and an Obsidian Nodule (#FS002A).